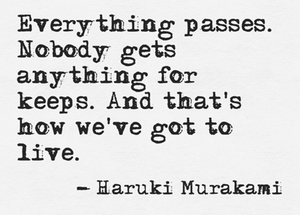 In honour of that fact that I have finally made it to reading Kafka on the Shore, we are starting our week off with a little wisdom from the fantastic Haruki Murakami. Enjoy this last week of June, my friends. Read some books, drink lots of tea, and take a walk in the sun (*cough* rain). Next ›Happy Birthday George Orwell!